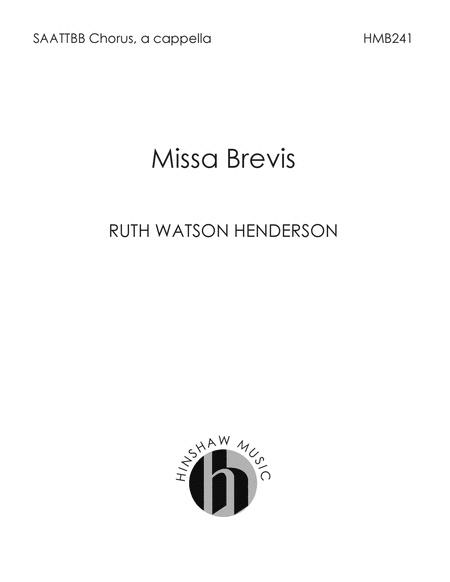 Composed by Ruth Watson Henderson (1932-). Hinshaw Sacred. Concert, Sacred. Octavo. 24 pages. Hinshaw Music Inc. #HMB241. Published by Hinshaw Music Inc. (HL.8763213). Text translation: Kyrie: Lord have mercy, Christ have mercy, Lord have mercy Gloria: Glory to God in the highest, and peace to His people on earth. Lord God, heavenly King, we worship You, we give You thanks, we praise You for Your glory. Lord Jesus Christ, only Son of the Father, Lord God, Lamb of God, You take away the sin of the world: have mercy on us; You are seated at the right hand of the Father: receive our prayer. For You alone are the Holy One, You alone are the Lord, You alone are the Most High, Jesus Christ, with the holy Spirit, in the glory of God the Father. Amen Sanctus: Holy, holy, holy Lord, God of power and might, heaven and earth are full of Your glory. Hosanna in the highest. Blessed is He who comes in the name of the Lord. Hosanna in the highest. Agnus Dei: Lamb of God, You take away the sins of the world, have mercy on us. Lamb of God, You take away the sins of the world, have mercy on us. Lamb of God, You take away the sins of the world, grant us Thy peace. Duration - 00:12:34.